[post_ads]"It's a working meeting from which no specific results are expected," she told reporters. The two leaders last met in Sochi in May and struggled to overcome differences. "We can be cautiously optimistic," Hardt told the Stuttgarter Zeitung and Stuttgarter Nachrichten newspapers in an interview published on Saturday. "The Russian president has maneuvered himself into a dead end on Syria and eastern Ukraine, and needs international partners. For that he has to move." "In a world that is increasingly uncertain, we must speak particularly with difficult partners like Russia," he said. On Syria, Germany wants Putin to finalize a lasting ceasefire there in agreement with the United States. Merkel on Friday said a four-way meeting on Syria involving Germany, Russia, Turkey and France was possible. The United States says it will increase Germany's dependence on Russia for energy. Ukraine fears the pipeline will allow Russia to cut it off from the gas transit business. Germany's eastern European neighbors, nervous of Russian encroachment, have also raised concerns about the project. 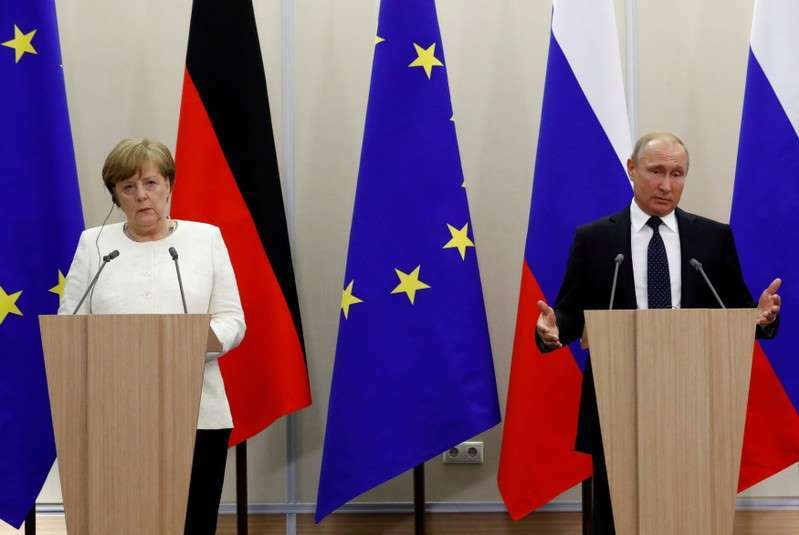 Merkel and Putin will each make statements at 1600 GMT on Saturday before the start of the talks. They do not plan to take questions.